With the launch of our new Handstand Factory programs on the horizon we are excited to open registrations for our 2nd launch celebration retreat, this time for Handbalancing Beginners and intermediate practitioners! 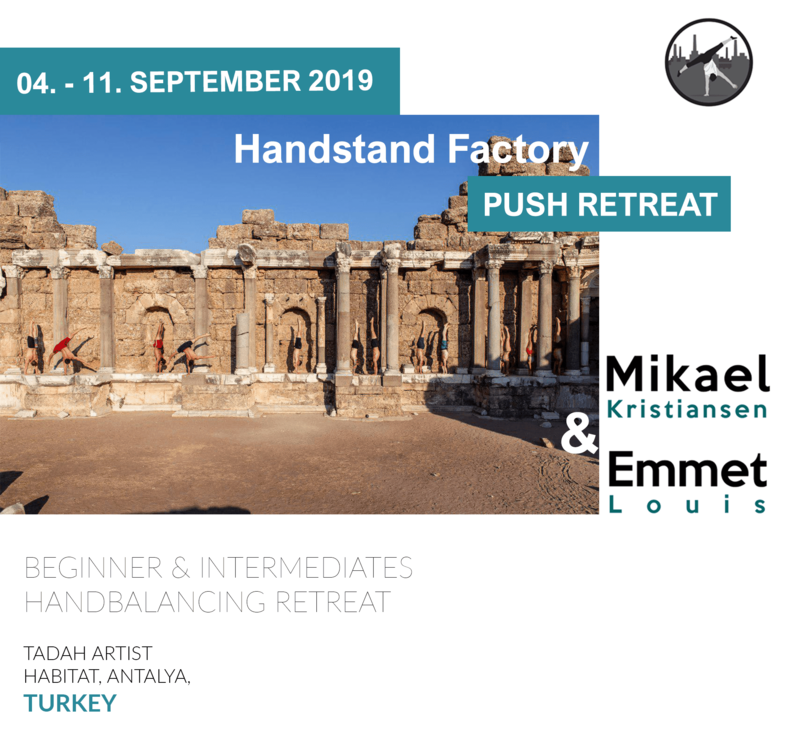 It’s a 7 day beginners and intermediate handbalancing and flexibility retreat in Turkey with Mikael Kristiansen and Emmet Louis, based on and open for future students of the Push and Keep Pushing online courses. Because this is a celebration retreat, you will get one course (either the Push or the Keep Pushing Course) for free when you sign up to the retreat 🙂 It will become available to you as soon as we publish the courses. Since the launch of our first program, we have been overwhelmed with the positive response from you guys, and the many requests for beginners and intermediate programs. Now that they are in the making, we would like to invite you all to celebrate the launch with us while deepening your practice, meeting your fellow Handstand Factory students (and us) in person, and spending a week immersed in full training in Tadah Artist Habitat, Antalya. In line with the Push and Keep Pushing programs, the focus of the retreat will be on beginners and intermediate practitioners in their handbalance training. The week will be centred around training for, achieving, or progressing your straight two arm handstand, as well as beginning to work on all the different handstand shapes and effortless changing between them. Along with the handbalance training, we will be spending a lot of time on learning about flexibility to aid you in your handbalancing practice. This retreat is open to students of the Handstand Factory – Push (Beginner) and Keep Pushing (intermediate) programs! As the courses are still in the making, you will receive one free copy of either the Push or the Keep Pushing course as part of the retreat once you sign up! Access to your chosen program will be given once they are launched.